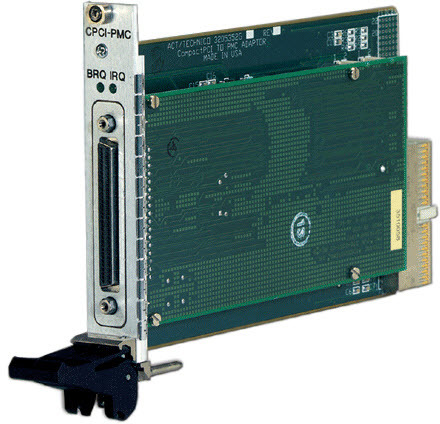 8 Port Comm Bus Interface Card - GX3904 | Marvin Test Solutions, Inc. The GX3904 is an 8-port, cPCI asynchronous communications interface board supporting 4 RS-232 and 4 RS-422 signal levels. The four RS-232 ports offer a full set of data and modem control lines configured for DTE operation. The four RS-422 ports offer differential signaling and support DTE operation. Each RS-422 differential pair is terminated by a 150 Ω parallel resistor. An optional transition cable is available to convert the front panel SCSI connector to 8 DB-9, D-sub connectors. Support for each port is provided by a 16550 UART which operates at data rates up to 115 K baud. Mapping of PCI interrupts to each of the 8 interrupts associated with each UART is done via on-board programmable routing logic, allowing any UART interrupt to be routed to any of the PCI INTx request lines. The default routing after reset is for all interrupts to be routed to the INTA line. UART 16550, one per port. Interrupts from each UART can be mapped to any of the four INTA – INTD PCI interrupt lines.